ST. JOHN'S, N.L. 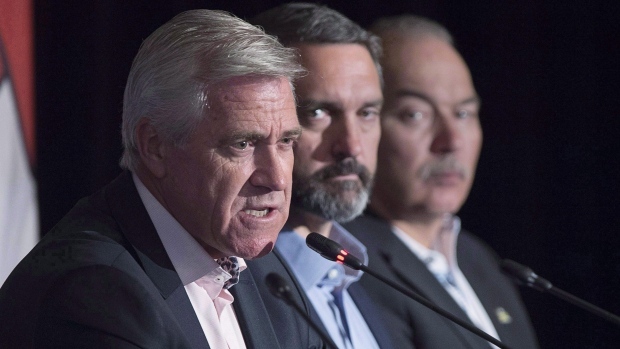 -- Newfoundland and Labrador's premier said he was disappointed but finally ready to turn the page Friday, after yet another court loss in the province's long feud with Quebec over Churchill Falls power revenues. Premier Dwight Ball says a Supreme Court of Canada ruling Friday -- which leaves his cash-strapped province stuck with a lopsided 1969 deal -- will not interfere with the province's relationship with Quebec. "The past is the past. For us, the decision is the decision," Ball said Friday. "What I've recognized a long time ago (is) we make more progress, we get more benefits for people of our province when we work together." Ball suggested there would be no further court challenges from his current government of the decades-old contract that saw Hydro-Quebec agree to purchase Churchill Falls power at a fixed rate set to decrease over time. The deal has since delivered more than $27.5 billion to Hydro-Quebec and around $2 billion to Newfoundland and Labrador. The stark imbalance in profits has been the source of decades of animosity between the two provinces -- and a number of legal battles that have exclusively sided with Hydro-Quebec. The latest challenge began in 2010, when Churchill Falls (Labrador) Corp. Ltd. argued unsuccessfully before the Quebec Superior Court that Hydro-Quebec had a "good faith" obligation to reopen the contract based on unforeseeable changes to the energy market. The decision was later upheld by the Quebec Court of Appeal. The Supreme Court ruled 7-1 in favour of Hydro-Quebec on Friday, finding no duty to renegotiate, regardless of the contract's unanticipated "substantial profits" for Quebec. Nalcor energy, the provincial Crown corporation that is the parent company of Churchill Falls (Labrador), said in a statement Friday that it accepts the court's decision. "This decision is final and brings to an end an eight year legal process," the statement read. "We are disappointed with the outcome but will continue to honour the contract and continue to work co-operatively with Hydro-Quebec." Ball said he wasn't surprised by the judges' decision. Neither was former premier Tom Marshall, who said in an interview that he was "profoundly disappointed" by the news. Marshall was justice minister when he was introduced to the "good faith" argument the case hinged on, that says in such a lengthy contract, changes in the electricity market should be considered. "This action was not asking for the contract to be cancelled. This action was simply asking for fairness," Marshall said Friday. "I feel very sad right now, but I think we certainly gave it our best shot and got a fair hearing at the highest court in the land." Marshall said he respects the expertise of the judges, but he had been hopeful the "good faith" argument might result in changes to what he sees as an unfair deal for his province. "I'm at an age where I'm not going to be around when that contract comes to an end, when they negotiate a new one. I'd like to know what's going to happen," Marshall said. The contract was renewed in 2016 and expires in 2041. Before that date arrives, Newfoundland and Labrador faces stark financial challenges. The Muskrat Falls hydroelectric dam in Labrador has now more than doubled its costs and is currently the subject of an ongoing public inquiry. Ball said planning for Churchill Falls power sales after 2041 will begin "far in advance." In the meantime, Ball is discussing other collaborative opportunities with Quebec, like expanding Labrador's mining industry, and maintained that a friendly relationship with the neighbouring province will be for Newfoundland and Labrador's benefit, despite the historically rocky relationship. Natural Resources Minister Siobhan Coady said the harsh lessons learned from watching the electricity market transform will factor into the shaping of future contracts. "Things changed since the contract was awarded back in 1960s, and we'll be all the more wiser I think as we move to 2041," she said.